The Roads and Transport Authority (RTA) was formed by the decree number 17 for the year 2005. RTA is responsible for planning and providing the requirements of transport, roads & traffic in the Emirate of Dubai, and between Dubai and other Emirates of the UAE, neighboring countries in order to provide an effective & an integrated transport system. Dubai also has an extensive taxi system, by far the most frequently used means of public transport within the Emirate. There are both government-operated and private cab companies. The Dubai Transport Corporation operates cream-coloured taxis. Some of the private cab companies are Cars Taxi, National Taxi, Cititaxi and Metro Taxi. The meter generally begins as Dhs. 12.00 when a requesting a cab from the call center, and 5.00 Dhs. when taking a taxi on the road and is generally charged by distance at 1.5 Dhs./km. The minimum fare charge though is 12.00 AED. There are approximately 7900 taxis located in the city. The Dubai Metro currently operates two lines. The construction contract for the project was given to Dubai Rapid Link (DURL), a consortium led by Mitsubishi Heavy Industries, in 2005. The construction of the red line began in September 2005 and the red line started operating on 9 September 2009, with its extension opened in 2010 and 2013. There are currently 29 stations on the red line. The construction of green line started in 2006 and the green line opened on 9 September 2011. There were initially 18 stations and two more stations were added in 2014. The Green Line runs from Etisalat to Creek and the Red Line from Rashidiya to Jebel Ali. Three new lines and extension of the two existing lines are planned but currently no concrete construction plan has been confirmed. Currently the total length of the metro system is 74.6 km, within which 13 km is built underground. 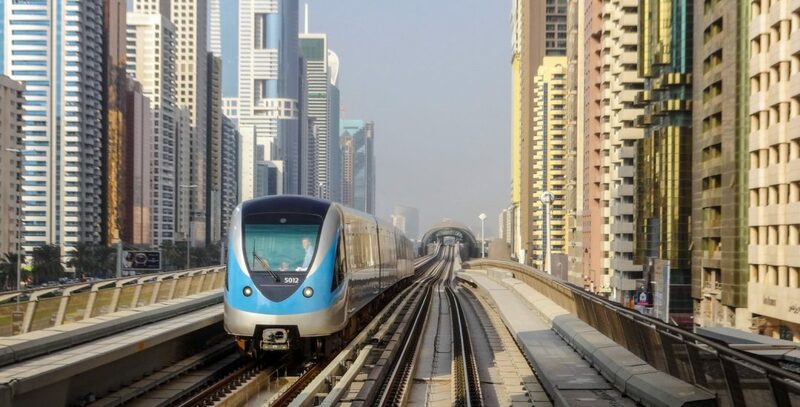 Seven monorails are also slated to be constructed to help feed the Dubai Metro, connecting various places such as Dubailand, the Palm Jumeirah and other districts the main track. The first of these, the Palm Jumeirah Monorail, opened on 30 April 2009. Two stations are in operation, while two more stations are expected to be added in the future. Dubai has a very large bus system run by the Roads and Transport Authority (RTA) . The bus system has 193 routes on weekdays and transports over 30 million people weekly. The Public Transport bus system is large and advanced. Unfortunately, the number of buses does not increase with the same rate as the amount of passengers, which makes this problem worse as time progresses. The (RTA) had announced that Dubai roads will see 1616 new buses. The buses will be of various sizes & models. The new fleet was expected to be fully operational by the end of 2008. Under brandname DubaiBus an extensive bus system is operated. Some buslines are feeders for the metro system. 656 of 1500 bus stops are equipped with airconditioned shelters. The bus fleet consists almost entirely of low floor European-made, air-conditioned buses by Neoplan, Mercedes-Benz, Solaris and VDL. Although the city of Dubai is growing year by year, the number of passengers is hardly rising. It is possible that this is a result of constant metro extensions. As of April 2008, there were two expected tram systems to be built in Dubai by 2011. The first is the Downtown Burj Dubai Tram System, and the second is the Dubai Tram. The Downtown Burj Dubai Tram System is a 4.6 km (2.9 mi) tram service that is planned to serve the area around the Burj Khalifa. Announced in April 2008 by Emaar, the Dh 500 million system will have two separate lines. The first line, which is expected to open by the end of 2009, will run 1.1 kilometres (0.68 mi) from Dubai Metro’s Burj Khalifa station to the Dubai Mall with one stop at The Address Dubai Mall. While this line will have trams running in both directions, the second line will only run in one direction. The second phase, expected to open in 2010, will serve ten stations. The 4.6 km loop will travel clockwise and will have a total travel time of eight minutes. In the same month, the Dubai Roads and Transport Authority announced the Dubai Tram(previously known as Al Sufouh Tramway). This tram service would run 14.5 kilometres (9.0 mi) along Al Sufouh Road from Dubai Marina to the Burj Al Arab and the Mall of the Emirates. It is expected to connect with two stations of Dubai Metro’s Red Line. Phase 1, which was expected to open in April 2011, was finally opened in 2014; it has 11 trains with 13 stations running 10 km (6.2 mi). Once Phase 2 is complete, the tram will add 14 more trains and six stations on the additional 4 km (2.5 mi). The planning and construction of the Dubai Tram was undertaken by a consortium of Alstom, Besix and Parsons. The trams for the network will be 44 m (144 ft) long, have a capacity of 300 passengers and will travel at a maximum speed of 50 km/h (31 mph) and an average commercial speed of 20 km/h (12 mph). Running for 20 h each day, it will take only 30 min to ride the entire length of the system The Dubai Tram will use Alstom’s Citadis 402. To provide safety, comfort and aesthetics, the Dubai Tram corporates methods not found in many trams around the world. These trams use ground-level power supply; in other words, the trams do not need overhead cables. This recently invented method, also referred to as Alimentation par Sol or “Aesthetic Power Supply” (APS), is currently used in Bordeaux,France. In June 2010, the consortium led by France’s Alstom and the local/Belgian Belhasa Six Construct stopped work on the estimated $1.1bn Al-Sufouh tram project in Dubai because of irregular payments from the project client, Dubai’s Roads & Transport Authority (RTA). Dubai is served by two large commercial ports, Port Rashid and Port Jebel Ali. Various cruise ships dock in Dubai. Dubai Creek and Port Saeed are used by local traders in dhows. One of the more traditional means of getting across Dubai Creek between Bur Dubai and Deira is on abras, small boats that ferry passengers across the Creek between stations in Bastakiya and Bani Yas Road, for a nominal charge of 1 UAE dirhams. They can be rented, along with an operator, for 100 UAE dirhams, approximately US$27. The Marine Transport Agency, part of the Road and Transportation Agency, started the Dubai Water Bus System on Dubai Creek in July 2007. Years ago there used to be a seaplane service which used to take passengers to other parts of the emirates. Dubai International Airport is a hub for Emirates and FlyDubai and has a large duty-free shopping centre. The airport has won numerous awards for its excellence in design and services. A third terminal, which fully supports the new Airbus A380, was opened in October 2008 and doubled the airport’s capacity. A new concourse catering to the A380 was completed in late 2012. Al Maktoum International Airport, that opened on 27 June 2010., will make a new free trade area within Dubai and be the centerpiece of the Dubai World Central aerotropolis. The airport was announced in 2004 and construction began in January 2005. The first part was expected to be completed by 2008. Although initially intended as a predominantly cargo airport, plans are afoot for it to handle some 120 million passengers per annum within 20 years, which would likely surpass Atlanta’s Hartsfield-Jackson International Airport as the world’s busiest airport. Since 2013 only a handful of airlines operate out of Al Maktoum International Airport in terms of passenger services. Dubai is investing heavily in developing the reach of its airline Emirates. The hope is to develop Dubai’s air transportation industry to the point that passengers from any city can fly direct to Dubai. When Emirates Airline receives the Boeing 777-200LR aircraft—part of its November 2005 order for forty-two 777s—it will be able to offer direct flights to nearly any major city in the world. The airline has also placed an order for 45 of Airbus’s A380 superjumbo double decker aircraft, the largest of which has a capacity of 641 passengers. The A380 aircraft have been flying since August 2008. In addition Etihad Airways provides bus coaches between Dubai and Abu Dhabi International Airport for Etihad customers. Air Arabia provides a similar service for its passengers to Sharjah International Airport, which due to its proximity is used as an alternative airport by Dubai residents.